20,000sf, 8-story new development. 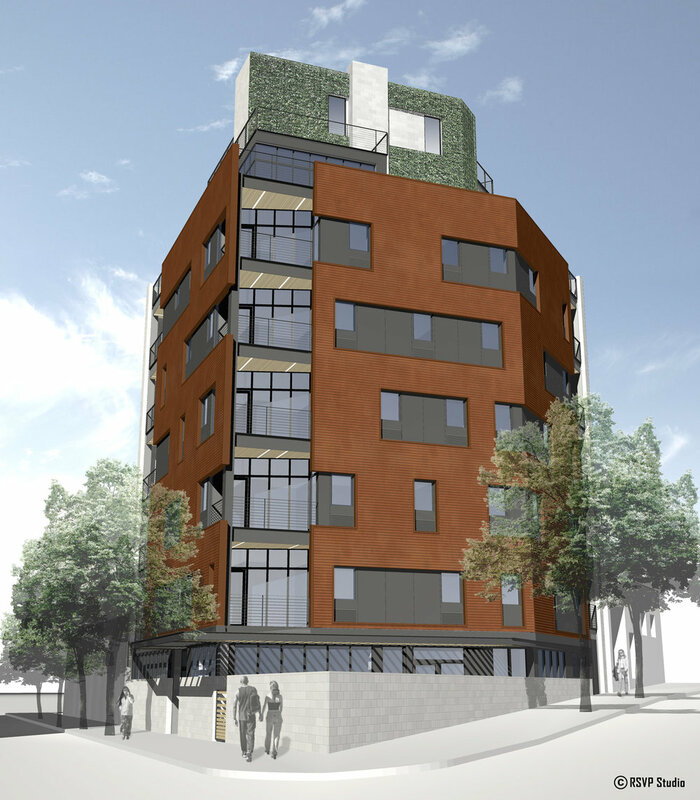 13 residential units with direct elevator access. Located across from PS1 in Long Island City, this 8 story condominium presents a striking landmark in a rapidly developing area. The unusually shaped 'flatiron' site provided both design challenge and opportunity. A continuous masonry wall wraps the perimeter of the site at the ground floor, articulating the acute angle of the street intersection while providing a base for the tower rising above. Clerestory windows topped with an open canopy further emphasize the break between the two masses and reinforce the gesture of the continuous horizontal base. The exterior skin of the upper floors is composed of corrugated weathering steel, nodding to the area's industrial past while providing a surface that will record the building's own aging process. Treated as a thin veneer, this facade is incised with horizontal strips that cluster the windows into staggered bands moving across the elevation. Each building face is pulled from away from the corner to create a recessed balcony with an extraordinary Manhattan view. The plan layout features two apartments per floor centered upon a common circulation core. This efficient configuration eliminates the need for public corridors and minimizes building system infrastructure. The 7th and 8th floors form an expansive duplex apartment with access to a large roof terrace. Public outdoor space is provided at a separate area of the roof, as well as at the ground floor courtyard.